Celebrate your birthday, anniversary, or holiday event at the Garden! 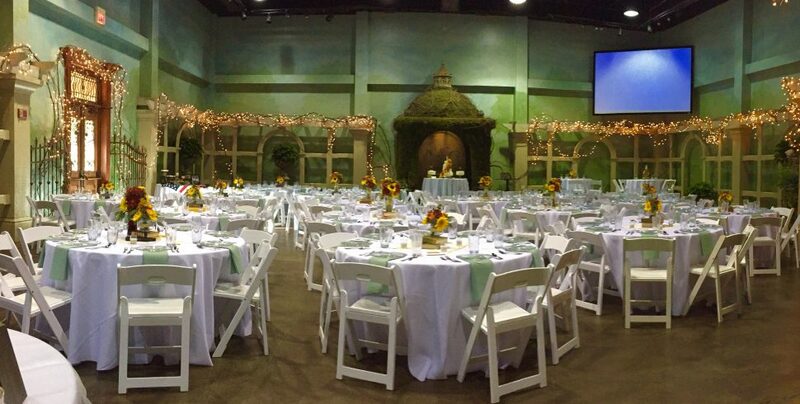 The Grand Hall is the largest reception venue at the Garden, providing dining seating for up to 350 guests. 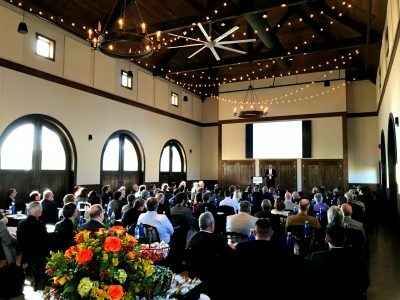 With a built-in dance floor, five sets of double doors opening up to a beautiful veranda overlooking Little Smith Lake and a large pre-function lobby at the entrance, the Grand Hall is the perfect venue for any corporate event. The lobby of the Grand Hall is spacious and majestic and is the perfect place for a cocktail hour, seating chart and placeholders, photo booth, or guest check-in. The veranda overlooks beautiful Little Smith Lake. Private to the Grand Hall, it is a wonderful place for a bar, giving you and your guests an easy and comfortable transition to the outdoors. The veranda is also a great extension of the dance floor and another perfect venue for a cocktail hour. 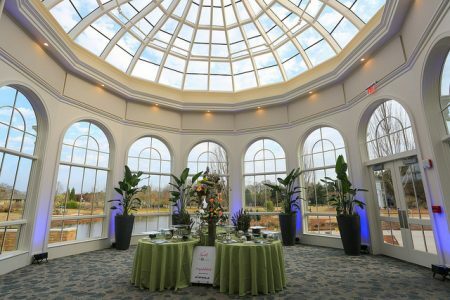 The Conservatory, with a view of Little Smith Lake, is a stunning glass house and is the quintessential intimate space for a luncheon or other memorable event. Its size makes it an excellent venue for small parties or business meetings. The Carriage House, with its rustic elegance, can seat up to 150 guests for dining. It has a beamed ceiling, beautiful chandeliers, and carriage house doors that open on two sides of the building. The Carriage House is ideal for a holiday party or business meeting. The Arbor is a lovely, garden-themed space conveniently located next to the Linda J. Smith Administrative Building. With its warm ambiance, the Arbor is ideal for both casual and formal receptions, anniversary and birthday parties, graduation parties, and rehearsal dinners. 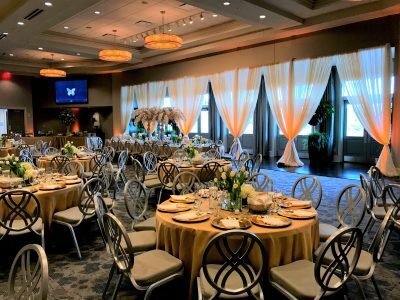 Your rental includes indoor tables and chairs, catering kitchen, library, a built-in sound and projections system, and a staff member during your event. 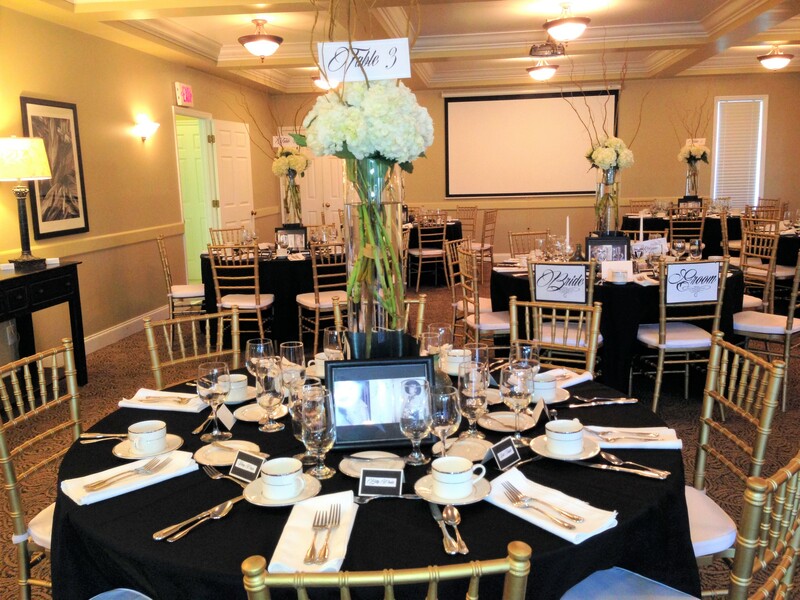 Murray Hall is the ideal location for a rehearsal dinner, anniversary party, or reception. Murray Hall is decorated in lovely neutral shades and is light-filled from the large windows on three sides of the main room. Nestled on a hillside overlooking Little Smith Lake, the view of the lake and the surrounding gardens is breathtaking. The large deck that spans two sides of the building gives you an outdoor space that is perfect for a bar and bistro tables. The Pavilion is a rustic outdoor area equipped with electric outlets, ceiling fans, and lights. The Pavilion is ideal for a family reunion, casual business luncheon, birthday party, or picnic. The Pavilion does not include Garden admission. Garden admission may be purchased at a rate of $4 per person with your rental. The Pavilion’s grass area will accommodate inflatables. There is a $50 charge for each inflatable. Each inflatable must be professionally installed. Additional fees apply for Pavilion events requiring other than the standard set-up. The open-air Amphitheater provides semi-circular seating and a stage with magnificent Ionic columns. Outdoor power sources are available. Rental does not include admission to the Garden. The Garden is a truly unique and beautiful location to host your wedding, corporate event, or social gathering. Our team of rental experts will be able to walk you through the entire process and answer any pending questions. We look forward to sharing in this exciting process!